Modular Storage Systems have just completed a Pallet Racking Relocation and Install on the Gold Coast. 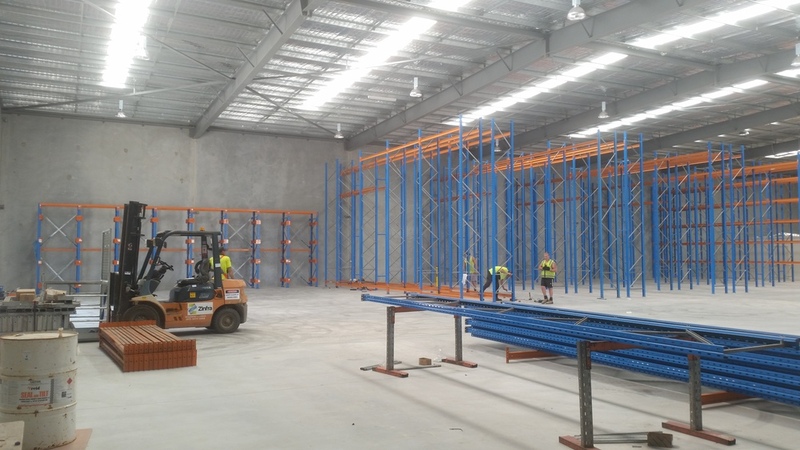 The client who was based in Brisbane had a large quantity of existing Pallet Racking that had to be dismantled, prepared for transport and then re-installed on the new Gold Coast site. Modular Storage Systems first met with the client on the Gold Coast at the new proposed warehouse and completed an initial site measure and discussions with the client to establish the exact project requirements. Once the design specifications were provided, Modular Storage Systems completed an assessment of the existing Pallet Racking at the clients old site in Brisbane to ensure it was able to be used on the new site. CAD Drawings of the proposed Pallet Racking System for the new site on the Gold Coast were generated and e-mailed to the client for review. Modular Storage Systems were successful in the tender process for the project and within 3 business days the Supply and Installation of the New Pallet Racking was completed in the new Gold Coast Warehouse. This quick turn around allowed the client two weeks to remove their stock from the existing Pallet Racking in their Brisbane Warehouse and load it into the New Pallet Racking we installed in the Gold Coast Warehouse. Once the clients existing Pallet Racking was empty our Installation team dismantled the system and relocated it to the new site. Repairs and changes required were completed and within 3 days the clients Pallet Racking had moved almost 100km down the M1 to the new site on the Gold Coast and was Installed to the new AS4084-2012 Standard with zero down time or disruption to their day to day operation. This was another successful Pallet Racking project completed by the team at Modular Storage Systems who are based in Yatala and proves that good project planning is essential for these types of Pallet Racking jobs. The Pallet Racking industry is full of companies that just want to make a quick buck and don't take the time to really understand the project at hand. We know the guys at www.racknstack.net complete these projects properly also. Modular Storage Systems like to work closely with the client on all projects to ensure a successful outcome for both parties. This ensures the client is happy now and Modular Storage Systems becomes their partner in any future Pallet Racking or Shelving projects. If you would like to discuss our services and products, please don't hesitate in contacting Chris via e-mail at chris@modularstorage.com.au or 0402 685 512 - We would love to hear from you!